As a teenager, I had a high interest in science fiction. I marveled at how the space ships (and flying saucers) could fly around without using primitive rockets (they obviously had mastered gravity). I often wondered why we weren't using flying saucers ourselves. This put me on a journey of trying to understand what gravity really is. I began reading books on relativity, but each one resulted in disappointment. I was getting tired of the bowling ball distorting a stretched sheet of rubber' analogy. It was becoming painfully apparent that nobody really new what gravity actually is. The mathematics didn't help either. I wanted to know what gravity actually looked like down at the quantum level. This, of course, led me to the world of (A)ether. Using ether to describe empty space appealed to me, but it didn't seem like there were any successfully developed ether models that could compete with (or replace) relativity. In the late eighties, I had my first flash of intuition where I decided to use foamy ether to describe empty space. This helped me tremendously in visualizing gravity where massive particles somehow cause distortions in this foamy ether. This model, however, was still unsatisfactory because it still had the universe filled with two substances (particles and foamy ether). It wasn't until the late nineties that I had my second flash of intuition and realized that I could eliminate the particles altogether and replace them all with distortions in the foamy ether. Now the universe contained only one substance (foamy ether) and all the particles in it were mere distortions of the ether. This solved the problem of massive particles having to move through the ether; instead, it was the ether distortion itself that moved. This ether model worked so well for me that I had to share it on a web site. But before I could do that, I had to find some 3D graphics software that would test my foamy ether model and visually demonstrate this to the reader. This is where ThreeDimSim came in. This 3D simulation software allowed me to build a working model of foam and use it to demonstrate how forces like gravity and electromagnetism work in the ether. 1975 to 2009 - Worked for TELUS Communications Inc. in various roles: Network Switch Maintenance, Fibre Optics Maintenance, Network Switching Engineering, Technology Strategy, Web Development. 2005 - Developed foamy ether theory and posted article "Foamy Ether- A Framework for a Theory of Everything". 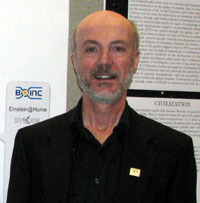 2008 - Attended the AbSciCon 2008 conference and presented a poster entitled "Searching gravitational waves for intelligent messages".